When is an Asian not an Asian? Evidently, it is when Hollywood chooses the actors. After all, Emma Stone was cast to play a character named Allison Ng in the movie Aloha. More recently, the recasting of the formerly Tibetan Ancient One, a male character, as a white female leaves it clear that Hollywood has a serious problem accepting the idea that Asian-American actors can serve as a major part of a successful film. It must be noted that this is not simply a case of ignoring Asian-American actors; this is a case of explicitly taking characters that were portrayed as Asian in the original material and whitewashing them. The planned Hollywood release of Ghost in the Shell is another egregious example of this, where the Japanese character Major Motoko Kusanagi will be played by actress Scarlett Johansson. It is plain to see that to many studios in Hollywood, an Asian-American lead is a toxic commodity. The excuses Hollywood offers are as numerous as they are unconvincing. The most common excuse for this lack of casting is the fact that there are no "A-list" Asian-American actors that can carry a movie. And yet, none of the current crop of "A-list" actors began as famous actors. By never giving Asian-American actors a chance to shine as a part of major productions, Hollywood creates a self-fulfilling prophecy by preventing Asian-American actors from gaining the "face time" needed to establish their popularity with the public. Many studios also claim that Asian-American leads will increase the chance of commercial or critical failure. However, Hollywood also insists that the commercial and critical failure of movies where whitewashing occurred is not connected to the erasure of roles for Asian-American actors. Many studios hold to this claim even where negative critical and popular reception points specifically to a movie's erasure of Asian-American roles. More importantly, the 2015 Hollywood Diversity Report stated "films with relatively diverse casts were found to excel in terms of box office receipts and return on investment." If American audiences would not accept Asian-American leads, it would seem logical that these same audiences would also take issue with diversity in general, and yet this has not proven to be the case. If anything, American and foreign audiences seem to be very receptive to diverse film casts. Hollywood has often prided itself on being socially forward looking, yet its treatment of Asian-Americans and other minority actors has been anything but socially progressive. To be blunt, it is difficult to see any reasoning behind this consistent policy of whitewashing roles other than a deeply ingrained culture of racism within Hollywood. In fact, many of the reasons being given today to excuse whitewashing would be familiar to black actors who struggled to break out of the ghetto of comedies and find serious work while Othello was played by Laurence Olivier in blackface. Worst of all, both the erasure of Asian-Americans and the continuation of negative stereotypes when they do appear in TV or movie roles has had a tremendous negative impact on how Asians are viewed in the US. When the only time an Asian-American is seen in film is in the role of comedy relief, socially awkward nerd, or hyper-sexualized dragon lady, it has a very real and negative impact on how people perceive their Asian-American neighbors. So how can this problem be rectified? Clearly, Hollywood is not simply failing to learn its lessons, but appears to be determined to continue this policy, standing against more diversity in US films, however beneficial such a change would be. Advocates for change must focus on continually maintaining awareness of this unjust and racist situation, not simply when a movie appears in the public consciousness, but at all times. Studios and directors who seek to create a more diverse cast should be noted and lauded while those who fall behind should be pressed to do better. In addition, successful multi-ethnic movies, such as the Fast and the Furious franchise, should be promoted as examples of films that are inclusive while also having great commercial success. By doing so, future Hollywood producers can be motivated to follow in these films' successful footprints. 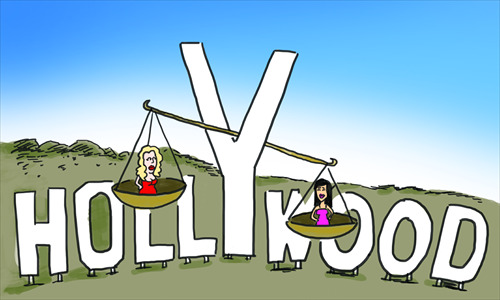 Hollywood molds public opinion regarding minorities, while it also showcases larger cultural issues of bias and racism. The continuing process of whitewashing reflects unfortunate racial stereotypes in the US and also helps encourage and perpetuate those same stereotypes in society. Only by confronting and ending movie whitewashing can this destructive process be stopped.